Once upon a time there was an Italian named Sergio Leone who was so fascinated by the mythology of the United States that he directed two meditations on that mythology. The first, Once Upon a Time in the West, explored the birth of industry and the destruction of the way of life of the old West. 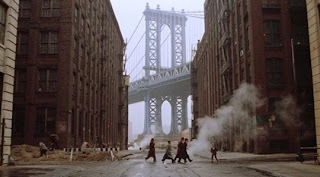 The second, Once Upon a Time in America, looked at early twentieth century poor Jewish immigrants and what amounted to the betrayal of the promise of America, the American dream. In Leone's words, it's about "time, memory, and the cinema." Both are among the greatest films I've ever seen. Once Upon a Time in America had a tortured history. Leone originally envisioned splitting the movie into two three-hour parts, but the studio insisted it be a single film. By the time it debuted at the 1984 Cannes Film Festival, it was 3 hours and 49 minutes. That's the version that ran in Europe. Against Leone's wishes, the movie was cut to 2 hours 19 minutes for its US run, and by all accounts that version is an incoherent mess. Leone died of a heart attack in 1989, and many of those closest to him attribute heartbreak over the mutilation of his masterpiece as the cause. 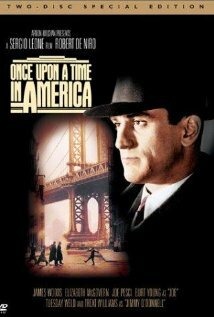 Once Upon a Time in America indeed proved be his last film. The movie begins and ends with renditions of "God Bless America." In between, there's a complex flashback narrative covering three time periods: 1921, 1933, and 1968. The movie begins in 1933. A woman is murdered by thugs in the opening scene, and the next scene sees low-rent Jewish gangster Noodles (Robert De Niro) taking comfort in an opium den. There's a good argument that everything that happens after Noodles smokes opium is a dream -- Noodles dreaming the American dream. Leone himself endorsed this view. A mist is a constant through all eras, which adds to the dreamlike quality of the film. It's all a foggy memory. The movie plays on memory triggers. A phone rings twenty-two straight times, leading Noodles to ponder the night he phoned the police to rat on his friends. One thing to note is that even if the 1968 part of the movie is literal and not Noodles's fantasy, the 1933 and 1921 portions of the movie are still merely memories. Memory is a tricky thing, and Noodles might not recall the events from earlier eras exactly as they occurred. Noodles remembers the last night of prohibition, the night he ratted. Noodles's best friend Max (James Woods) has conceived a plan to rob the New York Federal Reserve, and in order to prevent Max from following through with the crazy scheme, Noodles informs the police about a liquor run he and his buddies are planning. Noodles believes two years on a prohibition charge is better than decades for armed robbery. Things go very wrong and all his friends are killed. As it turns out, Max orchestrated the disaster and faked his own death, but Noodles blames himself. Everything that happens in the movie is a product of the guilt Noodles feels over responsibility for the deaths of his friends. Come 1968, thirty-five years later, Noodles is summoned by the mysterious Secretary of Commerce for the United States. It turns out that the secretary is Max, who faked his own death and stole $1,000,000 from a communal pot of money. If this is an opium dream, it's a way for Noodles to clear his conscience. Max is the one to blame. Max has gotten himself in trouble with bad people, and asks Noodles to kill him. Noodles refuses the job and finds redemption, at least in his fantasy version of reality. 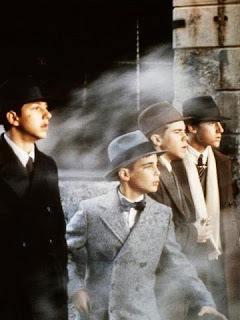 For me the movie is at its best when it's 1921 and we see the future gangsters as kids. These are poor kids living in the ghetto. Crime is a way out of poverty. Leone's attention to period detail is mind-boggling, and every shot seems to be a painting. It's breathtaking. As a kid, Noodles has a crush on a girl named Deborah, played by a young and beautiful Jennifer Connelly. Deborah likes to dance, and to let Noodles spy on her as she does it. In 1968, she has become a successful actress. What Noodles's friends have done with their lives come 1968 is strongly informed by what we see of them as children, again lending credence to the fantasy interpretation. They have become what Noodles expected them to become, they are a product of his psyche. Max fakes his own death, which is something he does in 1921 as well, tricking Noodles into believing for a moment that Max has drowned. Max and Noodles's relationship is complicated and there's more than a hint of homoeroticism to it. Max gets visibly annoyed when Noodles wants to spend time with women, and sleeps with every female that Noodles beds (and has trouble getting it up for the first girl in 1921). It seems like the person Max really wants to screw is Noodles, though, again, these are Noodles's memories, and perhaps he's projecting his own feelings on to Max. Time is a recurring theme. Watches and clocks abound. Noodles even has a key to a clock that he's held for thirty-five years. He returns it to its owner in 1968, who re-starts the clock. Time has literally frozen in the interim. The time and memory motifs are accentuated by Ennio Morricone's elegiac and nostalgic soundtrack, with "Deborah's Theme" providing the most direct link to the earlier Once Upon a Time in the West. I've only seen the 3 hour 49 minute version of Once Upon a Time in America. Martin Scorsese is working on securing the rights to footage that would allow restoration of Leone's 4 hour 29 minute cut. Scorsese himself paid homage to Leone in the Boardwalk Empire pilot, which includes a funeral procession for a bottle of alcohol on the eve of prohibition. In Once Upon a Time in America, it's a funeral procession for prohibition, the night before its demise.